Todays bag is an insanely detailed and professionally shot bag shot, with some fashion shots in there too! What do you expect from Italy though? Come and have a look at this brilliant bag. Hello there JCH and hello world! The bag I use daily it’s the original Bare Bones Bag from Indian Hill Image Works. I bought it a couple of years ago and I’ve been completely satisfied so far. It’s a very nicely handmade bag, extremely light and resistant. It’s got a reflective blue front, which comes in handy when I venture into those wild and dark pedestrian crossings in Rome at night. 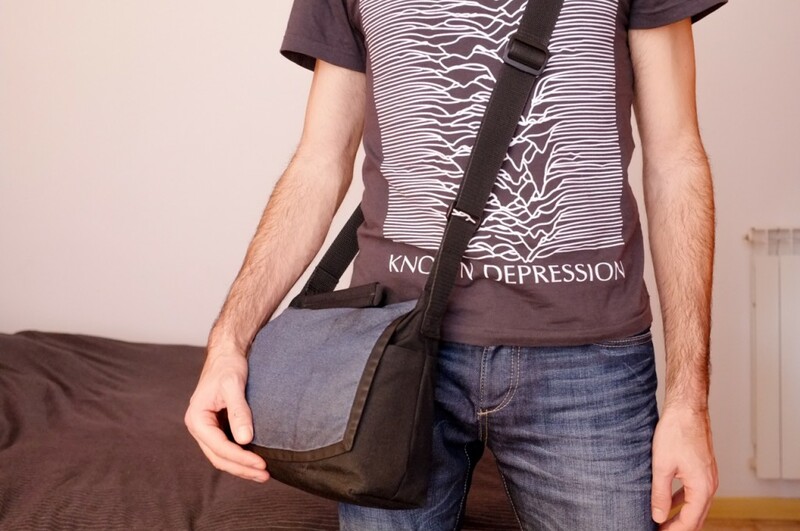 What really makes this bag stand out from the crowd it’s the lack of internal padding. “WHAT!” I hear you scream, “NO PADDING?” Well, there’s some padding on the bottom, but that’s it. The clever disposition of inside pockets does in fact provide some degree of protection. Anything more would make it stiff and heavier and wouldn’t really add significant protection to the bag contents, in normal circumstances. It’s kind of a leap of faith, I know, but it worked wonderfully so far. Besides, the fact that it takes so little physical space, allows me to easily slip it in a larger travel bag, for those occasions when I flight with those ultra-strict one-bag-only airlines (hello Ryanair). Enough talk about the bag. Let’s see what’s in the bag. First comes my preciousss: an all-black Leica M6, a very early model made in Wetzlar. It’s not a collector item, it’s been used and one can clearly see it, but I like it that way. Works like a charm. 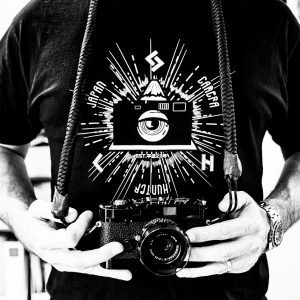 I black-taped the white engravings on the front and the infamous Leica red dot. I prefer it this way, it’s much sexier if you ask me. The M6 mounts a Summicron 50mm lens almost all the time. It’s the current version, with focusing ring and built-in telescopic hood. I couldn’t be happier with this lens: the focus ring goes so smoothly it makes me cry, and the built-in telescopic hood is just perfect: you slide it out and it stays firmly in place until you slide it in again. Not to speak about the images this lens creates: pure magic. As for the neck strap, it’s a red stitches leather one, made by highly regarded Mr. Zhou in China. It does its job perfectly, it’s one of the most comfortable neck straps I’ve ever tried. Next is a cute little Ricoh GR1s, a very recent addition to my camera bag. 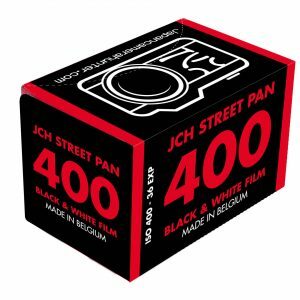 I am a big fan of Daido Moriyama and Jacob Aue Sobol and, knowing that they used it for some of their most famous works, I had to get one myself. 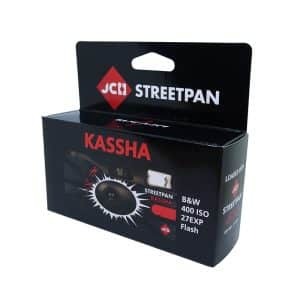 This camera is light, discreet, quick to operate and actually pocketable: it will easily slip into my back jeans pocket for those times when I can’t or don’t want to carry a bag with me. Also, the 28mm focal length is a refreshing change for me, and complements nicely the 50mm on my M6. The little Giotto mini tripod is the ideal companion for my Ricoh GR1s, it proved to be very useful for taking night pictures and long-exposures. It’s even got a detachable camera mount (surprisingly neat feature for such a small tripod) and folds very nicely in its own fake-leather pouch. I then carry a spare battery for both my M6 and my GR1s. 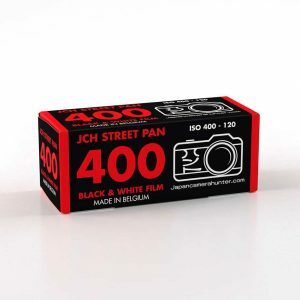 And spare film of course: usually Tri-X 400 for my M6, and some 400 ISO colour film for the GR1s. 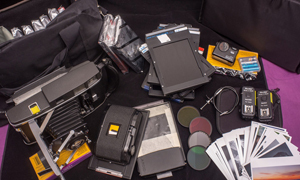 The two B+W 39mm filters, yellow and red, complete the Leica set. I’m an heavy user of public transportation, so I never go out without something to read. I bought a Kindle reader a year ago and never looked back. 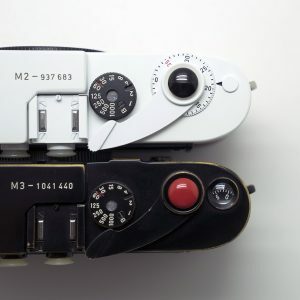 I read books on it which would weigh more than my Leica combo (hello 1Q84). Although I still prefer the look and feel of a good old paperback, the Kindle wins hands-down: it’s light, it’s small, perfectly readable, and stores more books that I could ever read in years. My mom made me a very nice soft cloth pouch for when I’m not using it. I also carry a little plain Moleskine notebook to keep track of what’s happening around me, and to take notes about each film roll I shoot (date, place, equipment, processing, etc.). Next is my utterly expensive Instagram camera: an iPhone 4S 64GB. I got a great deal buying it used when the iPhone 5 came out. I also use it as music player (I’ve got my entire music library on that little thing! ), and may even make a call or two once in a while. On each of the iPhone sides, its two faithful companions: the Sony MDR-EX38iP in-ear headphones and a battery charger. There’s still some space left for my wallet, my keys, a metro card, some MOO cards and a tiny Samsonite flat-folding umbrella. That’s pretty much all I carry with me when I go out. Hope you enjoyed it. If you’re curious about my photos, here’s some links for you. My Tumblr, I use it as a photography journal. My Cargo, an attempt to build a portfolio, still in the embryonic stage. My Instagram, I’m having a lot of fun on this one, it’s incredibly addictive. 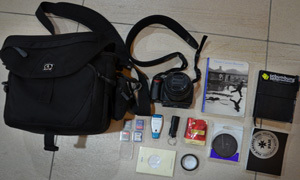 Thanks for sharing your brilliant bag shot with us Stefano. I really like the T-shirt too, my favourite band and a worthy cause. Check out Stefano’s links and make sure you come and comment. 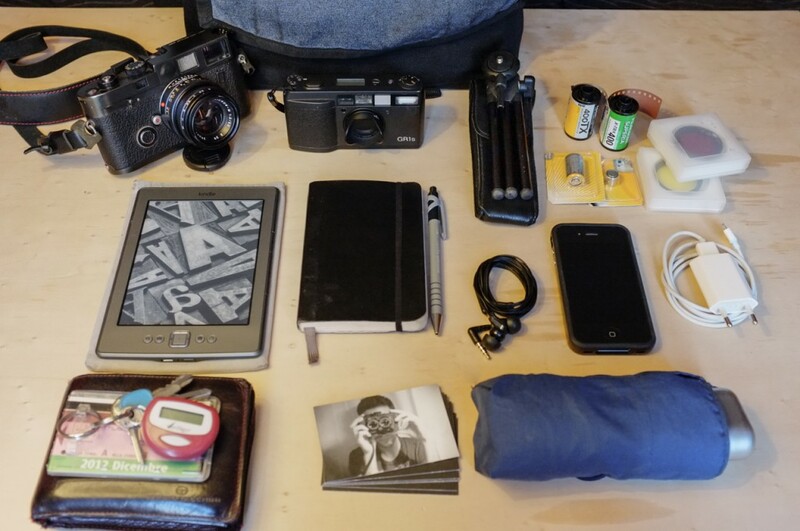 My lust for an M6 grows…..Solid bag though, the essentials with room for whatever else you may need. As already pointed out, that shirt is great. 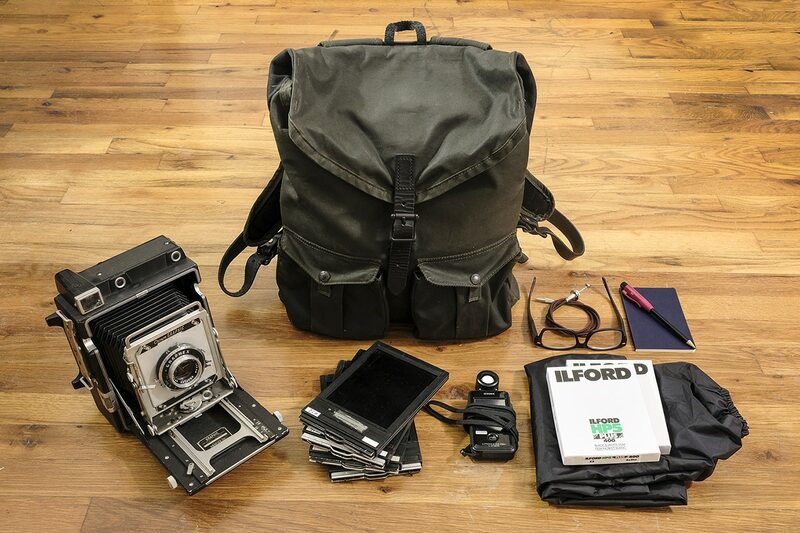 Great bag, lovey choice of cameras. I also use the same bag for small kits. 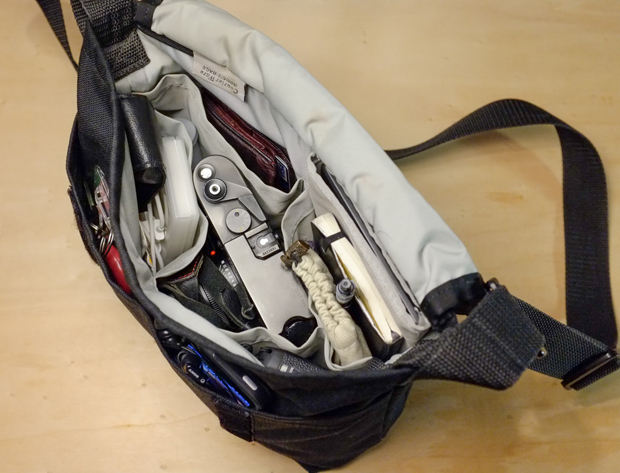 It’s a terrific bag — light, well organized, and really well built. I don’t miss the extra padding, and that has never been an issue for the gear (now an Olympus OM-D EM-5 body with up to three lenses, extra battery and hard-sided memory card carrier). E’ un piacere vedere un fotografo italiano, e per di più romano, sulle pagine di questo blog! Complimenti per l’attrezzatura e per la borsa! A really nice and simple setup. I took a look at the Cargo and Instagram sites (will look at the Tumblr site later when I have some time) and have to say you have some really great photos, especially the sets from Berlin and Rome. Stefano, great bag, I didn’t know you carried one ! Thought you just carried the cam. But nice to see what ya got though. Glad to see the Cron 50 has taken you! Hey Dave, yes I’m also a bit of a camera bag freak. 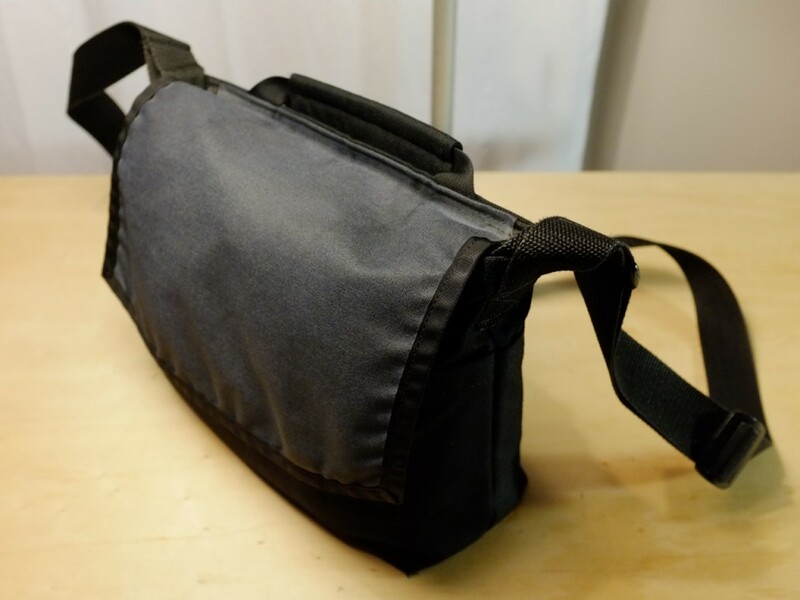 I used to have a Crumpler bag, than switched to a Muji canvas bag, had it reworked internally by my mom to rearrange the padding layers so to easily accommodate my cameras and finally settled for the BBB. About the Cron 50mm, yes it’s a marvellous lens and paired with my M6, it’s all I ever wanted, but somehow I miss the simplicity and elegance of my M2/Planar 50mm silver combo. I’m torn between which of them to keep and which one to sell.